George Hunt Williamson (December 9, 1926 - January 1986), aka Michael d'Obrenovic and Brother Philip, was one of the "four guys named George" among the mid-1950s UFO contactees. The others were George Adamski, George King, and George Van Tassel. And George's books contain quite a few messages from the UFO entities. we will succeed, ... pp. 19, 514, 516. The entity identified himself as OX-HO and declared that he had come from a galaxy very near our own to help the people on Earth... "People on Earth, open your doors to our help, for you need it desperately. Remember that we are always on the alert and (we) are now holding off and fighting any enemies ... Join our Confederation ..."
Brad Steiger, Aquarian Revelations: Channeling Higher Intelligence, pp. 98-99. This is a request for all the people of Earth to join the UFO entities' rebel confederation! John Keel, in his book UFOs:Operation Trojan Horse, refers to these entities as a bunch of evil liars and put-on artists. pp. 283, 299. Do the ultraterrestrials really care about us? There is much disturbing evidence that they don't. They care only to the extent that we can fulfill our enigmatic use to them. UFOs:Operation Trojan Horse, p. 247. And we do not desperately need to join their rebel confederation. BUT we can infer from this that the UFO entities desperately need the people of Earth to join their confederation! There is a spiritual war going on between these two confederations: the UFO entities' rebel confederation, and the Orion Confederation. As long as there are some people on Earth who are members of the Orion Confederation the UFO entities cannot claim complete conquest of planet Earth! The UFO entities have preparations and plans for planet Earth! George Williamson, Other Tongues—Other Flesh, pp. 19, 514, 515, 516. The UFO entities are working with deception and hostility! No, the real truth lies in another direction. The contactees from 1897 on have been telling us what they were told by the ufonauts. The ufonauts are the liars, not the contactees. And they are lying deliberately as part of the bewildering smokescreen which they have established to cover their real origin, purpose, and motivation. The thousands of contacts with the entities indicate that they are liars and put-on artists. UFOs:Operation Trojan Horse, pp.213, 283, 299. John Keel believed that the UFO phenomenon "smacks uneasily of a covert military operation." The patterns and occurrences of certain UFO incidents are such "that we must wonder if they aren't really deliberate." The UFO entities appear to be following a script of "carefully planned confusion and deception." They appear to "set up a careful smokescreen to cover their real activities." Like "the original Trojan Horse, they seem to conceal hostile intent. ... This hostility theory is further supported by the fact that the objects choose, most often, to appear in forms which we can readily accept and explain to our own satisfaction." OTH, pp.27, 64, 78, 94, 167. The UFO entities plan to eradicate those who do not join their rebel confederation! we will not have them disturb our preparations and plans for the Earth planet. George Williamson, Other Tongues—Other Flesh, pp. 514, 515. It is true this is mainly pointing at the Orion Confederation. But if you look at this carefully it is because we are not members of the UFO entities' rebel Confederation! It could be argued that the UFO entities plan to eradicate anyone who is not a member of their rebel confederation! The call in this quotation is for the people of Earth to Join the UFO entities' rebel Confederation! the UFO entities' own rebel Confederation, and the Orion Confederation. As usual this sort of battle comes down to making a decision between two opposing sides. There are no others. And there is no middle ground in this final conflict! Help is coming from Orion! the evil destroyers ... migrated to Orion in spiritual form. George Williamson, Other Tongues—Other Flesh, pp. 501, 510. 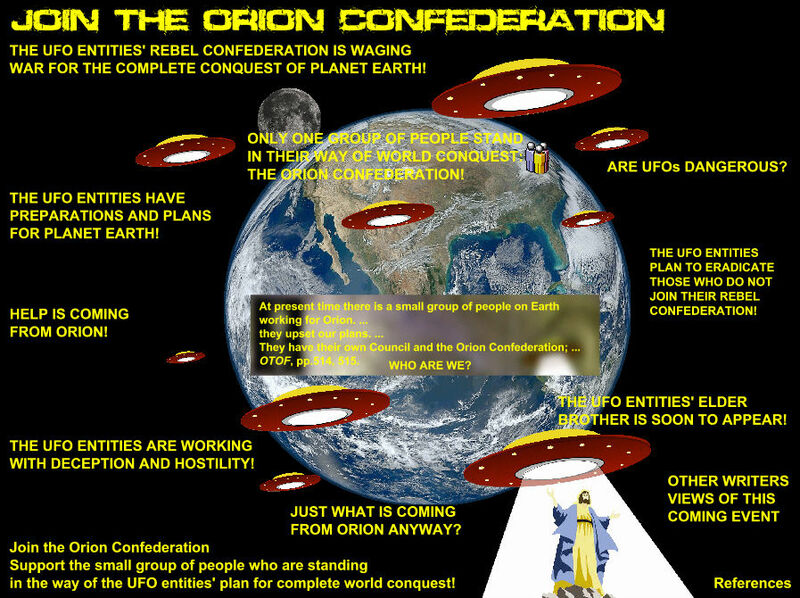 The Orion branch of the Orion Confederation is working toward the complete eradication of evil from the universe so the UFO entities have good reason to be concerned since their rebel confederation is evil in nature!! The UFO entities' Elder Brother is soon to appear! Very few ministers are telling their congregations that the Saucers may have a connection with the "signs in the skies" that the prophets of old spoke of. Some theologians, however, believe that the coming of the Saucers heralds the coming of the Elder Brother himself. The space friends have said that they would keep out all the negative forces, but they also said a "square star-body" was coming to Earth. As time goes on, the anti-Christ or negative forces will become more powerful. This is a sure sign of the Second Coming. George Williamson, Other Tongues—Other Flesh, pp. 432, 435, 484, 528[typo corrected]. UFO communications very clearly state that some great personage they refer to as the Elder Brother is coming in a UFO and will one day appear. How soon we do not know. And they refer to this as the Second Coming. The Second Coming is of course a reference to the Biblical Second Coming of Christ. This is interesting for if you read the Bible it states that the Christ is not coming in a UFO. The only conclusion that could be drawn from this is that the UFO entities' Elder Brother is a counterfeit! Many Christian writers have warned of a great personage appearing on the world scene who will take control of the whole world and send it down a road of terrible tragedy. And there is always mention of a faithful few who will oppose this threat and stand for the truth. 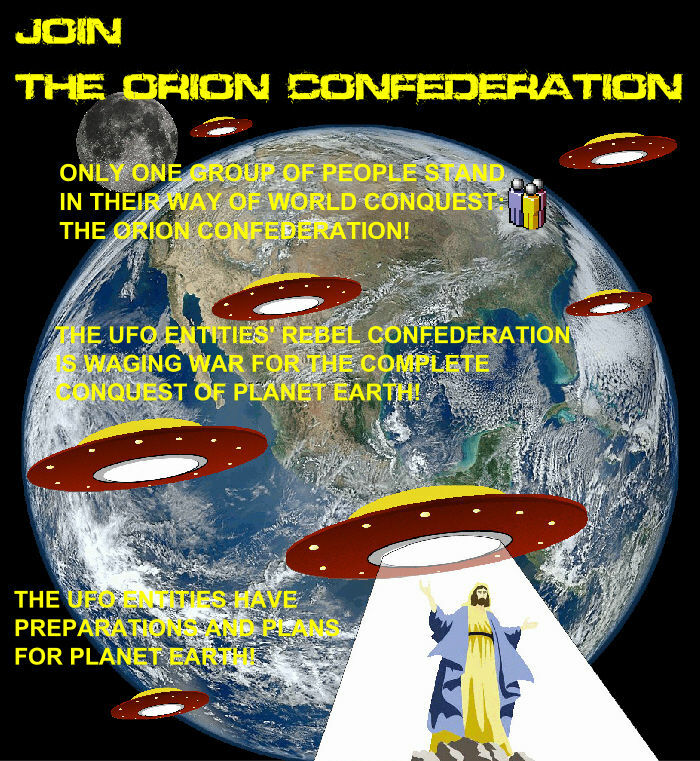 Only one group of people stand in their way of complete world conquest: The Orion Confederation! This is the pattern of The Intruder—to disrupt, cause dissension, strife, trouble, interfere! George Williamson, Other Tongues—Other Flesh, pp. 514, 515, 526. Members of the Orion Confederation generally meet once a week when they are able for discussions and encouragement and information sessions and spiritual support. Meetings are not closed. Visitors and new members are always welcome. See our general information page about who we are for further information. There may be a group meeting near your location. 1. The Triumph of God's Love, pp. 545, 546, by Ellen G. White, Pacific Press Publishing Association, 1939. Last revised: 16 Jan 2019. Heaps of questions and answers about the Orion Confederation and the UFO entities and the space people. Is there any recorded intelligence behind UFO activities? The main cause of heart attacks according to the UFO entities? The most profound thought the human race now possesses?